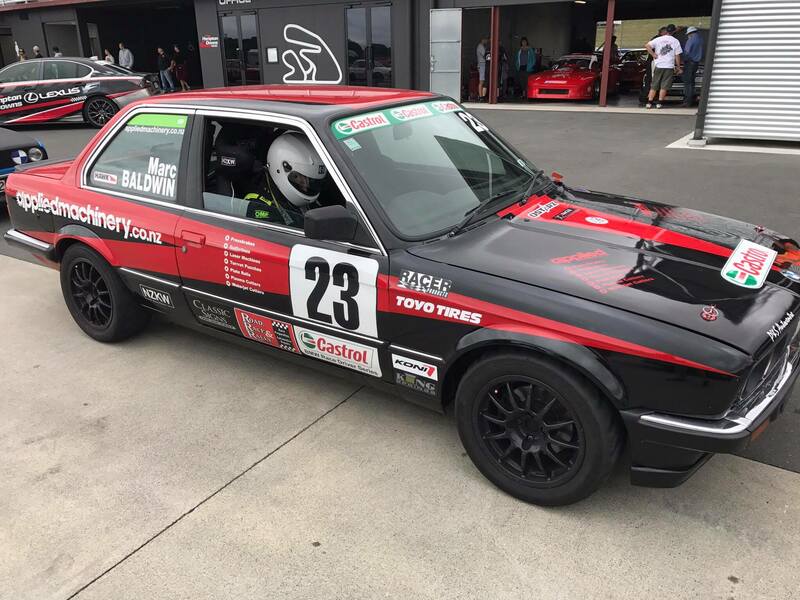 Round 7 and we were back again at Hampton Downs, I was looking forward to heading back to this track in the scholarship car as it was the first time back there since the car had been back on the pace. Friday practice started off very good, we had great pace out the gate and felt confident in the car after the first session. Unfortunately, our Friday session went rapidly down hill from there!! … about 2 laps into the second session the gearbox in the No 80 car blew. After a few panic phone discussions, we quickly loaded up the car and headed back to P&S who had a spare gearbox that we could put in the car to see the weekend out. Huge thanks to all the boys at P&S who stepped away from the jobs they were currently doing to make sure the gearbox change was done as quickly as possible in the hope that we could get back to the track and get another session in before the day was over. Everything seemed to be going back together smoothyl and after a quick test around East Tamaki we again loaded the car up and made our way back to Hampton Downs. As we pulled in to Hampton, our group were literally leaving the gate for their last practice session, I just managed to get it off the trailer and straight out for the last run of the day to make sure everything was working as it should. To our despair, we found a new issue, now we couldn’t get 2nd gear! Now we are really in a panic, after a quick check we learn that P&S don’t have another spare gearbox and it looks like being out for our crucial last meeting is in doubt, but in true spirit of the camaraderie that is ever present in this awesome class, we were soon offered a loan gearbox to see us through the weekend ….. a huge thanks to Phil Smurthwaite and Dave Whitburn who both offered us gearboxes to use for the weekend to get us through. So again we load up and off we go to P&S for a second gearbox change in as many hours. 9pm Friday night and we finally had a good gearbox in the car and were ready for qualifying first thing in the morning. Qualifying went well with no issues and all 5 forward gears so that was a good sign. We ended up putting the scholarship on P3 for the first race and felt we had a fast car for the races. Race 1… I got off to a poor start losing a couple of spots, the top 6 of us broke away from the field and we spent the whole race battling for the top few positions. After working my way forward, I was sizing up a pass for 3rd place with a lap to go but as I battled for the position, I came under attack from the cars behind, made a tiny error which resulted in me losing a couple of hard earned spots and ended up 6th over the line with a large gap behind us to the rest of the field. Although disappointed with the end race result, we posted one of the fastest lap times, maintained great car speed and felt good for the remainder of the weekend, whilst also bagging good championship points. Race 2 the reverse grid race…. I was off grid 33 for this one and needed to make spots early on to have a chance of a good result. As usual these races are a whole lot of fun and keep the race super busy, passing cars from the first lap to the last whilst also trying to keep the car straight in a field of well over 30 cars. We finished this race in 7th position making up some good ground during the race, and again good points to continue towards the championship race. Race 3 … we made some changes to the car as this was the last race of the season with not a lot to lose, turned out this was the best the car felt all weekend and had awesome pace. A race long battle with Ant Belsham for 3rd was an awesome way to finish the season racing door handle to door handle for the entire session. We had great pace, the Scholarship car was on rails but Ant, who had shown great pace all weekend, drove a wicked race and I couldn’t quite find a way through. I ended this race in 4th and 4th overall for the round. I didn’t quite manage to end the season with another round podium place, but still a great weekend. I also managed to take out the Rookie title for 2017 which was the goal since the start of the season. This I felt was a huge achievement after being 21st overall in the championship after the first three rounds due to mechanical failures and issues. A huge thanks to P&S, Dave and Phil for your efforts to make sure we raced the weekend as it wasn’t looking too good towards the end of Friday. Just goes to show the character of everyone involved in the BMW Race Driver Series! Also a huge thanks to Charlotte Baldwin for keeping the Scholarship car looking sharp with new vinyl and graphics when needed all season, and to Ted Pheloung and Che Takarua for knocking out any dents and keeping the car straight all season. I’m looking forward to what next season may bring, some exciting things planned … please watch this space!! 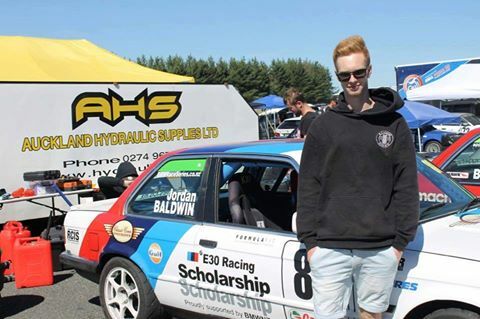 Castrol BMW Race Driver Series scholarship recipient Jordan Baldwin of Howick is becoming a regular top-three placer in the 64-car series, to rapidly climb the points standings ahead of the season 2016/2017 final race weekend. At the series sixth and penultimate round held recently at Pukekohe, he started the weekend setting second fastest time in qualifying. This builds on his best result of second overall at the previous Taupo event. Driving an E30 model car against 28 other teams in his group, the class is one of three that make up the travelling BMW series. 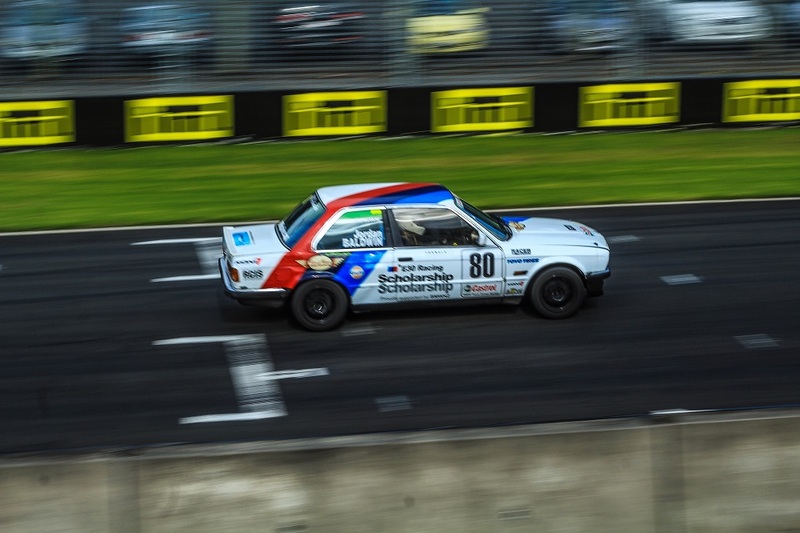 Having done just over a year in karting and with speedway experience, Baldwin arrived to the BMW saloon car series fresh to learn. The personable and articulate 18-year-old won the car-supplied prize to contest the current season – and is a stone’s throw from toppling series rookie Scott McCaskie for the coveted title. Taking his currently best race result of second during the opening round, Baldwin took the highs with the lows as he learned more about the craft of racing and the car. Storming back to the podium at the Pukekohe event, his third placing came from learned experience. “In qualifying, back in karts, I used to struggle by putting so much pressure on myself – trying too hard to put a good lap in. My main goal this year was to relax and treat it as a practice session – focus on staying calm,” explained Baldwin of his shift in style. “I knew we had good speed after the Taupo round so I wanted to treat Pukekohe’s qualifying like another practice session, and keep a cool head – just see what we could get. To see it was position two (second fastest) on a track I’d never raced before was pretty amazing. 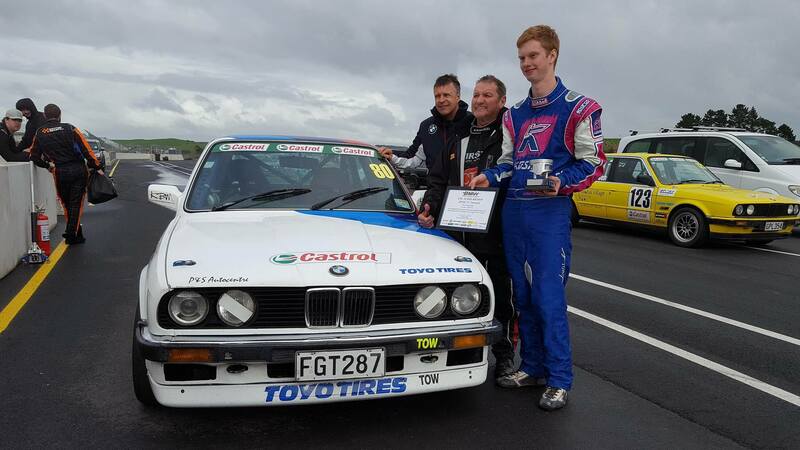 While it is Baldwin’s first foray in to car racing, he is joined by his dad – also competing in the E30 category as a rookie: “We are learning so much and are surrounded by so many good people along the way. People like Pete and Graham (Ball) from P+S Automotive. They are confident we can have a shot at the championship – next season. That includes sponsors who want to back me so we can have a good crack at it. Defending champion Matt Griffin took the round win, ahead of Royce Rollinson and Matthew Seddon. Baldwin finished fourth, 10 points behind Seddon. In the 2L class, 23 of the teams were wondering what previous round lap record setter Graham Ball could achieve next. Second fastest in qualifying, well over a second behind his father and defending champion Peter, Graham took the opening race win. 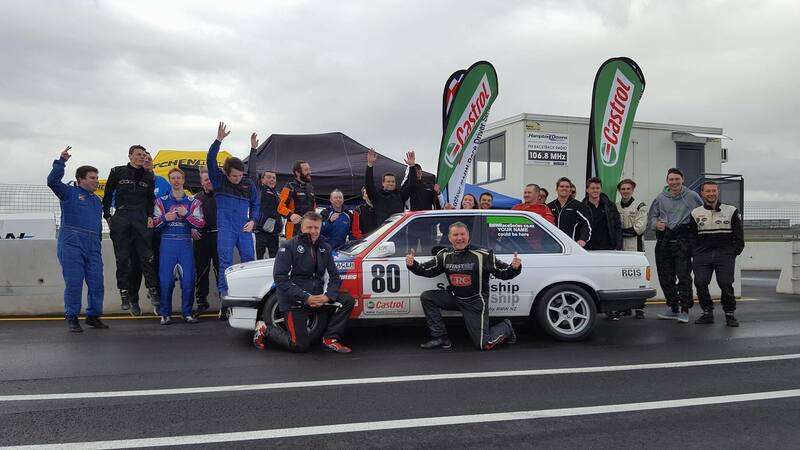 While Andrew Sharp won the remaining two races it was consistency by Marty Seddon in his 318i that put him atop the weekend results – by one point. A similar result came from the Open Class. Incorporating three sub-classes, the 12-car line-up was headed by Group A driver Andrew Nugent (Auckland) in the E92 M3 GT2 specification car. Fastest in qualifying the first two race wins went to Matakana’s Andre Mortimer. The final race win went to Robert Berggren with consistency rewarding Nugent, who took the overall win – by two points. Marty Irvine topped the Group B field with three consecutive race wins while Nigel Patterson’s consistency in the Group C field will assist him to the season title. Round 6 of the championship has now been and gone. This was the first meeting of the series to be held at Pukekohe and my first time racing on this track. Friday practice looked like it would be wet all day, this was a good opportunity for me to get some wet laps under my belt as I hadn’t done any wet weather laps anywhere prior to Friday. The first session was wet and with a small number of cars on track was a good chance to familiarise myself with the conditions. After this initial session though, the sun came out and the track was dry until after lunch. We had good pace in the dry and were confident of a decent weekend if the weather held off. Soon after lunch the rain came down again, this time very heavy…… after a brief introduction to the Pukekohe wall, we were ready for the weekends racing. Qualifying on Saturday morning was dry, and after the predominantly wet day before, was a good sight to see. I managed to get into a good spot on the track with some clear air in front of me. The car felt good and by the end of the session, I had put the #80 car on P2 for the first race of the weekend!! This was an awesome feeling lining up beside Matt Griffin on the grid at Pukekohe, the calibre of this guy’s driving and car control is second to none! Race 1, I managed to get a good start and beat Matt Griffin into turn 1. Myself , Griffin and Rollinson opened up a gap to the rest of the field, switching places back and forth for the first half of the race. After some awesome battles and racing, I finished race 1 in 3rd spot. I was stoked to be consistently towards the front of the field after the way the season started off, certainly makes for a more enjoyable weekend. This bagged some crucial points for the championship as I try to chase the rookie of the year award. Race 2 was the reverse grid race…. grids were determined from our qualifying times, this meant that I was off grid 33 beside Matt Griffin. What a full on race this turned out to be with cars constantly passing over the 8 laps. I managed to progress from 33rd to 11th and although disappointed we didn’t crack the top 10, it was good to finish with no damage and again gain some solid points for the series. Upon returning to the pits I was informed the old man had won the reverse grid race, gaining his first ever win. Wicked feeling to see the joy and satisfaction on his face after all the time, effort and money he has put into my own racing to date. The final race of the weekend I was off grid 5, meaning we were 5th on points going into the feature race. With dad directly behind me on the grid I needed to get off to a good start. (couldn’t have him come out on top in two races!) I felt we had good pace leading into this race and was focused on getting on the podium for the overall round result. Unfortunately, the changes we made overnight to the car setup, slowed the car a little compared to the day before, I came over the line in 4th spot which had me finish in 4th overall for the weekend on points. ….. Overall a very good weekend for myself and dad. Good points for the championship totals,…. after the 2nd round at Manfield, with all the early car issues, we were way down in 21st spot, I will wait for the confirmed points to come out, but the progression has been huge since the last Hampton downs round. Finally a good weekend in the BMW! 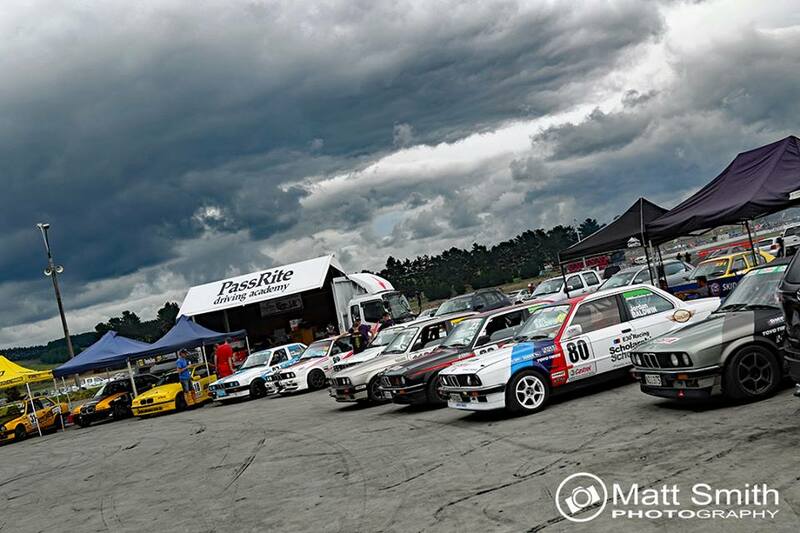 Headed to Taupo Motorsport park for round 5 of the championship. After struggling all season with what ended up being a cracked block on the motor. A fresh engine and a full going over from P&S automotive the scholarship car was back on the pace. A couple of small mistakes during qualifying put us in 6th in the field out of 25. But felt confident we could make progress during the races. Race one, got off to an ok start and settled into 6th early on. Managed to move forward to finish 4th after a door to door battle for 3rd with Scott McCaskie on the last lap. Race 2 we were off grid 24, got a good jump off the start and knew we needed to make passes early on in the race. After a full on 10 laps we ended up moving from 22nd to 4th with the second fastest lap. This put me 2nd on points heading into race 3. 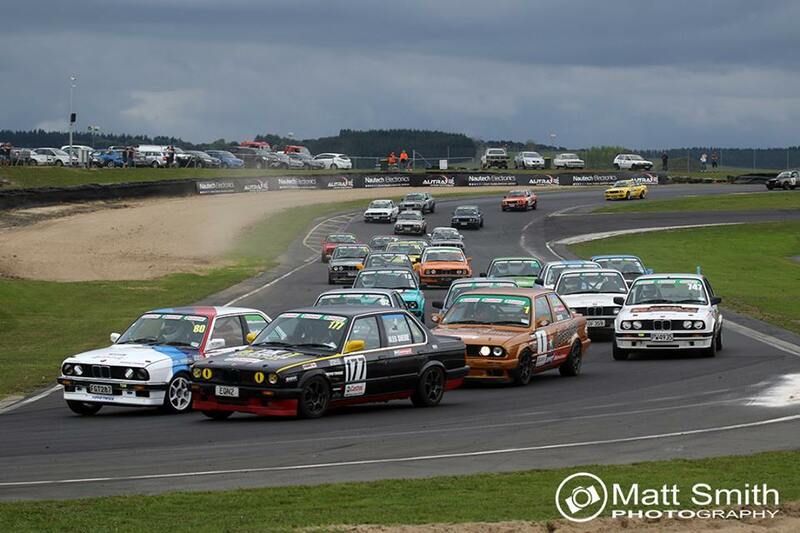 Race 3 grids were off points from the first 2 races, started off grid 2 beside Matthew Griffin. Settled into 3rd for the majority of the race until I made a small mistake on the last lap, this meant another 4th place finish. And at this stage 2nd overall for the round. Good to finally bag some decent points for the championship!! Friday practice started with a fairly disappointing opening session, still struggling with outright speed in the Scholarship car. Due to the ongoing issues we have had prior to this round, I was determined to make some forward progress in the season points. The second session was a crucial turning point into how the round played out. I decided to jump in my dad’s car (23) to find out if the lack of speed was down to myself or an issue with the car. After posting some times that were significantly faster than what I had ever done in the 80 car, we knew the disappointing results up to date were not entirely down to myself. I got another run in the 23 car at the end of the day to try and familiarise myself with the way the car felt as this was my first time driving that car. Saturday morning was a new day and from the feedback we gave to Peter and Graham, further changes had been made to the No: 80 car to try and get it back up to speed. We went out for qualifying and what felt to be like a fairly good lap, was actually still nearly 2 seconds off the front group of cars…. Unfortunately the issues hadn’t been completely fixed. Dad and several members of the organising committee discussed the situation and just as we lined up on the dummy grid for the first heat, the decision was made to allow me to complete the rest of the round in the 23 car…… in a frantic turn around, I jumped out of the 80 car and into the 23 car …. Dad forfeited the rest of the meeting, cheers for that dad!! Race 1 we were off our original grid position from qualifying (in the 80 car) which was grid 18. Still not quite settled from the rapid change over, I didn’t get the best start and lost a spot heading into turn 1, I felt comfortable early on in the 23 car though and comfortably moved forward from 18th to 9th as the first race progressed, setting the 6th fastest time in the process. This meant I was off grid 26 for heat 2, the reverse grid race. I was by now getting more to grips with the car every lap I did and I managed to move from 26th to 7th in this race… that was a very busy 10 laps!! Heat 3, the final race of the weekend, and for the first time so far this season, I had earned a spot up towards the front end of the grid. Starting off grid 6, this race ended up being my best race to date in the series and the most fun I have had in a tin top car. 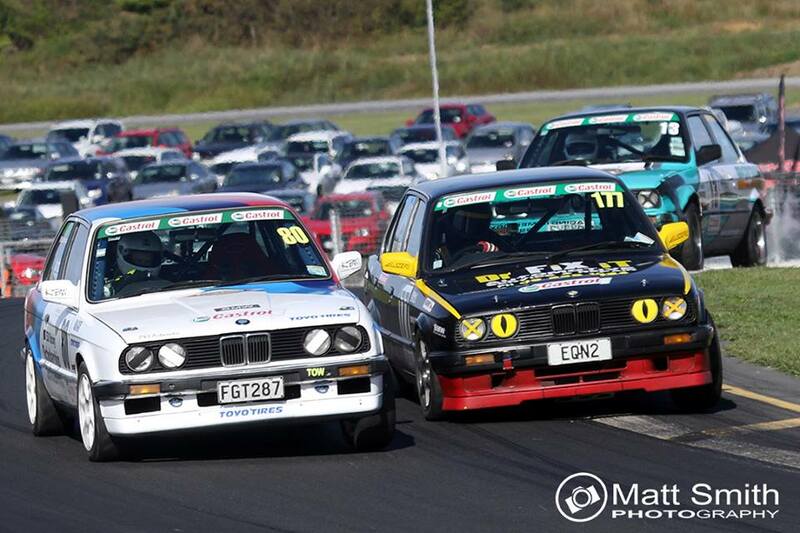 Battling door handle to door handle for 10 laps for 4th position with Mark Crompton and Matthew seddon. I ended up 6th at the end of the race but was stoked to be able to battle at the front end of the field. This had me finish 5th overall for the weekend, just one point behind Mark Crompton in 4th place. A huge thank you to Peter and Graham, for everything they have done and continue to do for myself and dad. 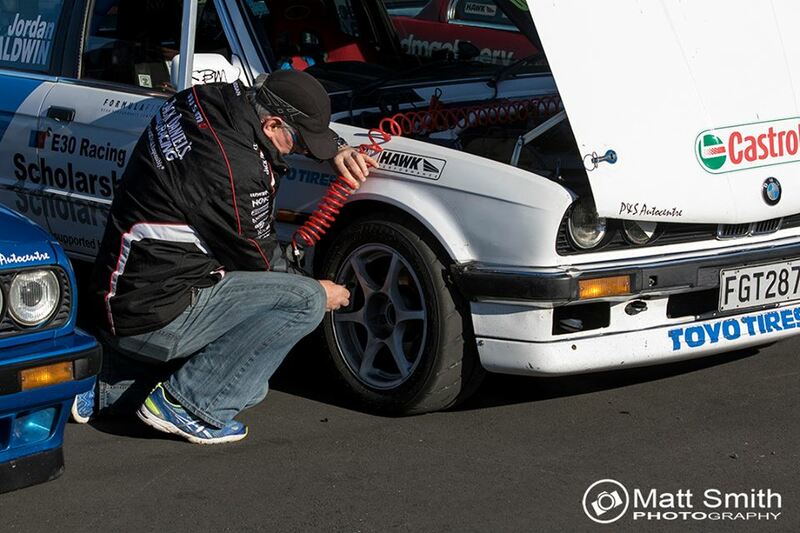 Time to reflect on my first weekend competing in the BMW E30 series in the No 80 Scholarship car. The weekend was a mixture of high’s and lows with mechanical problems providing the low’s and the eventual fix of the problems providing the high’s …. Another first for the weekend was competing against my dad (Marc Baldwin) in the series, the first time in the four years we have been involved in motor racing that I have had the chance to be on track with him in one of the cars…. Well done to him. Here is a brief run down of how the weekend unfolded …. 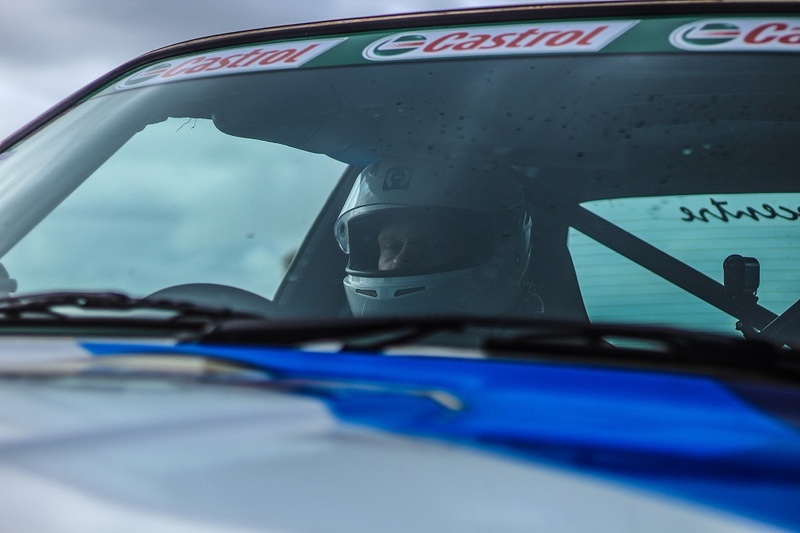 I was lucky enough to be able to race the weekend before the first round of the BMW series, giving me some seat time in the car and familiarise myself with Hampton Downs as I had never been there before. We headed down to Hampton Friday morning for the first practice day of the series. I was looking forward to getting back in the car to see how I compared to the series best. As the day progressed I felt I was making good gains in myself and further learning the track in every session, but we struggled with straight line speed. I spent a large of the day focusing on the final corner leading onto the straight, but as the day went on our top end speed problem seemed to get worse. Friday night we went down to P&S Automotive (who do an awesome job looking after the car and giving me advice) after a brief discussion, Peter highlighted a few changes he wanted to make to the car, confident it would resolve our issue before we headed into qualifying. First thing Saturday morning, Peter came over and made the changes to the car, I was keen to get back in and see how it performed. Unfortunately, as we went out for qualifying it was clear the changes had had the opposite effect, now the car wouldn’t rev over 5000RPM !!. After a frustrating qualifying session, we ended up 35th. I was disappointed as I was looking forward to a positive qualifying. This was now going to make the weekend very tough. Despite Peter and Graham having 3 cars of their own to worry about, both got stuck into the scholarship car trying to resolve the issue. Race 1, off grid 35. I managed to get a decent start and moved up about 3 or 4 places before turn two. As I headed around turn 6 onto the main straight I was hoping the car would now have some top end speed, but it was soon obvious the issues still hadn’t be resolved, as I quickly lost all the spots I had made up with cars now passing both down the inside and around the outside. Another frustrating session on the track, finishing where I started in 35th. Peter and Graham from P & S were straight over once again. (Huge thanks to Peter and Graham and all they do for the scholarship car and the series, not once did they fail to come over and do all they could to fix the issue.) again making changes trying to unlock some speed out of the car. A new air flow regulator was put in the car Saturday night, fingers crossed this was the answer to the lack of top end speed the car was struggling with……the only way to find out was to get back on the track amongst all the other cars. Starting off grid 9 I knew if the car was fixed, we had a good chance in the race. By the end of lap one, I could feel the difference in the car, finally the issue was resolved and for the first time all weekend I was able to keep up with the car in front of me going down the straight. Going into the last lap I was up to 2nd and had planned a move for the lead, but my very limited saloon car racing experience caught up with me, I made a small mistake going into turn 4, losing roughly 3 car lengths on the leader, I ended up crossing the line 0.2 seconds behind the winner. Race 3 I was off Grid 6, surrounded by some of the series fastest drivers. I didn’t get off the great start I was hoping for, losing a spot off the start. I settled into a good rythym and focused on minimising mistakes and improving where I could. Most of the race I was sitting in 8th until getting shuffled wide at turn 1, losing a couple more spots finishing in 10th. Overall I was happy with the first round. 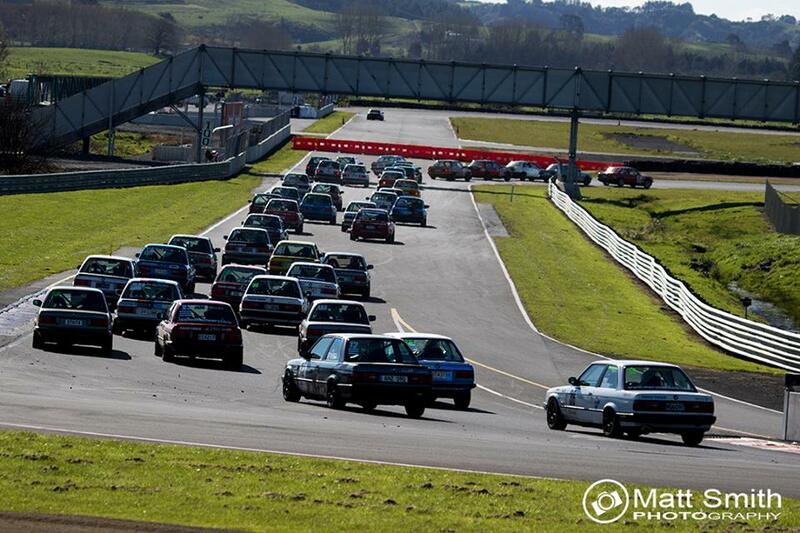 The weekend before being my first ever race meeting in a saloon car, and my first time at Hampton Downs. Lots to focus on for the next round in Manfeild, but looking forward to improving over the series and learning as we go. Also, I believe i came out of the round as the top points scoring rookie, which is one of my main goals for each round. 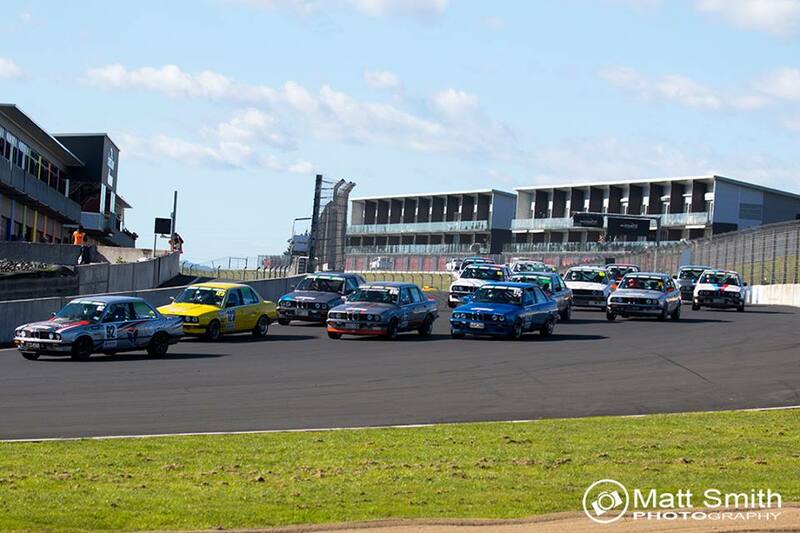 The events of the last few days are still sinking in, Saturday Morning Dad and I began the day with a familiar early morning start, only this time we were heading down to Hampton Downs to take part in the BMW E30 race series Scholarship … 22 of us hopeful candidates all assembled in the pit area, anticipation filled the air. We were told that we would all be going through the same vigorous selection process, 2 hot laps strapped into the passenger seat and driven around Hampton at race pace, then an interview in front of a TV camera to gauge our camera presence, an interview in front of a panel of judges would come next to test how we present ourselves and to get a glimpse of our general attitude, then 5 or 6 laps in the passenger seat next to legend ‘Racing Ray Williams’ who would give detailed instruction whilst driving us around the track, showing entry and exit points, breaking points, gear changes etc …. 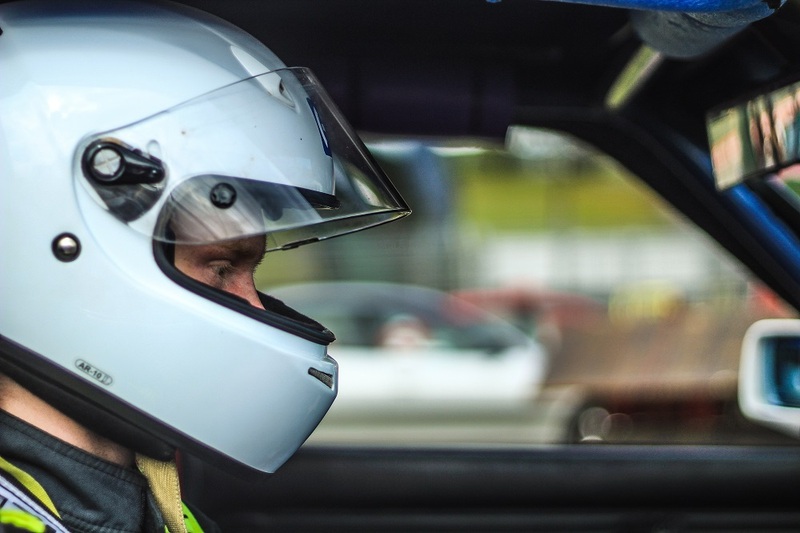 and then finally we would do 5, maybe 6 laps with one of racing’s elite, Mike Eady, who’s role it was to sit in the passenger seat and judge our driving skills …. No pressure!! Well, after all 22 of us had completed every test put to us, it was now down to the judges decision, we all assembled under the Judges room, nervous chit chat could be heard all around …. about 30 minutes later, a decision had been made …. Third place was announced and awarded, second place was announced and awarded …. I hadn’t made it to 2nd or 3rd I thought to myself… then it was announced, “And the winner, of the 2016/17 Scholarship is …. Jordan Baldwin”. It took a fraction of a second for it to register, in fact I had begun clapping for the winner before realising that it was actually my name they just called out …. Wow, what a feeling. 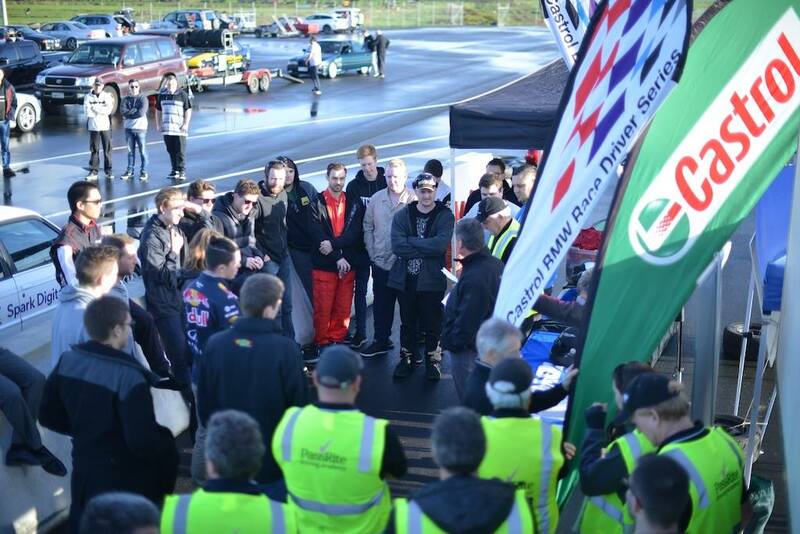 I’d like to thank everyone involved in making the Scholarship possible, the sponsors, the series drivers, the judges, the people in the background that planned it so well and the other competitors for making it an awesome day. I’m excited and really looking forward to competing in the series, See you out there! !